Civil forfeiture is a major issue that’s recently gotten into the news, notably due to Attorney General Eric Holder’s change to the controversial police action of seizing people’s property. Unfortunately, Holder’s actions, while laudable, won’t stop the massive damage that has already been done – and may very well continue the problem. Because although the media has finally begun to talk about the issue, we still haven’t been presented with a full scope of civil forfeiture: what it is and what it means. To understand forfeiture, one must go back to colonial America. The idea of civil forfeiture comes directly from the British; early forfeiture law “refers to the power of a court over an item of real or personal property.” This could include land, in which the court would decide who owned a piece of land, or marriage, where the courts would have the authority to terminate a marriage. Originally, in rem jurisdiction was “incorporated into American customs and admiralty laws governing the seizure of ships for crimes of piracy, treason and smuggling in the early days of the Republic, and during the American Civil War.” It was later formalized in 1966 “in the Supplemental Rules for Certain Admiralty and Maritime Claims which apply to our civil forfeiture cases.” So the United States has always had some type of civil forfeiture law. The situation changed, however, when President Nixon announced the War on Drugs and began to use civil forfeiture as an instrument of law enforcement. Author Montgomery Sibley notes that, as part of the Comprehensive Drug Abuse Prevention and Control Act of 1970, Congress strengthened civil forfeiture as a means of confiscating illegal substances and the means by which they are manufactured and distributed. In 1978, Congress amended the law to authorize the seizure and forfeiture of the proceeds of illegal drug transactions as well. Under Nixon, the Continuing Criminal Enterprise statute was also enacted, targeting repeat offenders of lucrative drug trafficking. Meanwhile, an important side effect of the Control Act was that it not only allowed police to seize private property being used in a crime – it also made clear that the owner of said property had to prove the property in question was not being used as part of a crime. In other words, when it comes to proving that someone’s property isn’t being used for criminal purposes, the burden of proof is on the owner, not the police. This creates a situation where the police can essentially confiscate someone’s belongings, allege that the items are being used to further a crime, and the owner must somehow prove that the allegation is false – something that can be extremely difficult to do. As soon as this occurred, America saw a massive increase in the amount of civil forfeitures carried out by federal agents between 1989 and 1999, when the value of civil forfeiture recoveries nearly doubled from $285,000,039 to $535,767,852 – a 187% increase in only 10 years. And the numbers only grew as time went on. In 2012, $4.6 billion was acquired via civil forfeiture, compared to a decade earlier, in 2002, when the amount seized was just $322,246,408. The increase of over 1,400% reveals a major cash cow for law enforcement. There was an attempt to reform civil forfeiture through the Civil Asset Forfeiture Reform Act of 2000. This included several changes most notably in regards to poor or impoverished defendants, where the new law ordered courts to issue the defendant a lawyer “when the property in question is a primary residence,” as well as to pay the lawyer regardless of the outcome of the case, whereas before, defendants had to essentially defend themselves. With that reform, it was no longer enough to say there was a possibility that the evidence could have been used in a crime. However, the law didn’t deal with the problem that the burden of proof was on the property owner, nor did it deal with the conflict of interest in which the government could seize property and sell it – using the money to fund its own operations. Because the pressing question still remains: how exactly do police use the funds they’ve gained from civil forfeitures? The Washington Post also reported that police are using the funds to militarize themselves, buying an array of items such as “Humvees, automatic weapons, gas grenades, night-vision scopes and sniper gear. Many departments acquired electronic surveillance equipment, including automated license-plate readers and systems that track cellphones.” And this spending is on top of the military surplus gear police receive from the Pentagon. While there is a federal force to ensure that funds are used appropriately, it’s wildly understaffed; the Justice Department has about 15 employees assigned to oversee compliance, with some five employees responsible for reviewing thousands of annual reports. Essentially, then, police are free to spend the money they gain from civil forfeitures on anything they want, without fear of punishment. Besides the previously noted conflict of interest and burden of proof issues, there are also other major problems with civil forfeiture – notably, the disproportionate racial impact and harm it causes to innocent people. Furthermore, in 2014, the Meiklejohn Civil Liberties Institute reported reported that civil forfeiture laws “routinely amount to de facto racial discrimination, as law enforcement officials routinely target low-income people of color, seizing their assets.” It quoted the ACLU as saying that “asset forfeiture practices often go hand-in-hand with racial profiling and disproportionally impact low-income African-American or Hispanic people who the police decide look suspicious and for whom the arcane process of trying to get one’s property back is an expensive challenge.” Thus, like many aspects of the criminal justice system, civil forfeiture disproportionately impacts minorities. Thus, civil forfeitures continue unabated for the most part. This data analysis revealed that “only about a quarter—25.6 percent—of properties seized under equitable sharing were federal ‘adoptions’ of properties seized by state or local law enforcement, the kind of seizures the new policy targets” and that “of the nearly $6.8 billion in cash and property seized under equitable sharing from 2008 to 2013, adoptions accounted for just 8.7 percent.” Put simply: local and state law enforcement can still engage in civil forfeiture and make large amounts of money off it. There have been attempts at reform. But both of them – the Civil Asset Forfeiture Reform Act of 2014, and the Fifth Amendment Integrity Restoration Act, which “would protect the rights of citizens and restore the Fifth Amendment’s role in seizing property without due process of law,” died in Congress. In the meantime, it seems that cops and the government will continue to cash in on the property of U.S. citizens. 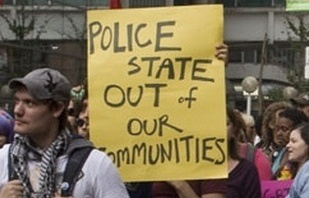 This article was originally published on Occupy.com The author can be reached at devondb[at]mail[dot]com.